0.4 density, 0.003" thick. Over 50% elongation and chemically inert. Provides a strong tight seal for any threaded joint and permits easy disassembly. Tolerates -400 to + 500 degree Fahrenheit. Suitable for use on oxygen systems. Non-toxic and non-flammable. Meets Federal Specification T-27730A. For use on plumbing threads to prevent leaking. 0.4 density, 0.003" thick. Over 50% elongation and chemically inert. Provides a strong tight seal for any threaded joint and permits easy disassembly. Tolerates -400 to + 500 degree Fahrenheit. Suitable for use on oxygen systems. Non-toxic and non-flammable. Meets Federal Specification T-27730A. For use on plumbing threads to prevent leaking. 0.4 density, 0.003" thick. Over 50% elongation and chemically inert. Provides a strong tight seal for any threaded joint and permits easy disassembly. Tolerates -400 to + 500 degree Fahrenheit. Suitable for use on oxygen systems. Non-toxic and non-flammable. Meets Federal Specification T-27730A. Manufactured especially for natural gas, propane, butane, water, oil and chemical lines. Heavier than white tape with density of 1.35 - 1.5 grams/cubic centimeter and 4 Mil thick. Complies with MIL-T-22230A (ASG), UL 31 RO, AGA 3226 and CAN/ULC-S642. Spool - dispenser box. 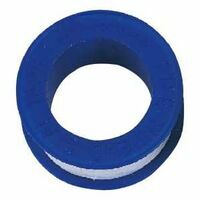 Provides fast positive seal for water lines, sewage lines, and sprinkler systems. Effective on metal or plastic threads. 3 Mils thick, and density of 1.35 - 1.5 grams/cubic centimeter. Complies with MIL-T-27730A and UL 31 RO. Spool- display carton. 0.4 density, 0.003" thick. Over 50% elongation and chemically inert. Provides a strong tight seal for any threaded joint and permits easy disassembly. Tolerates -400 to + 500 degree Fahrenheit. Suitable for use on oxygen systems. Non-toxic and non-flammable. Meets Federal Specification T-27730A. Extra heavy, full density tape especially for gas lines. Recommended leakproof sealant for lines carrying natural gas, propane, butane, water, oil and chemical installations. Use on plastic, stainless steel, aluminum and all metals, ceramic, synthetic rubber, monel and carbon pipe, conduit, valves, bolts, anything with a thread. Suitable for use on oxygen systems. Permits easy disassembly. Pressure rating 10,000 PSI; .0035 mil thick, tolerates -450 to +500 degrees Fahrenheit. Meets Federal Specification T-27730A. U.L. Listed.